Good evening, dear readers! Have I got quite a post for you tonight! 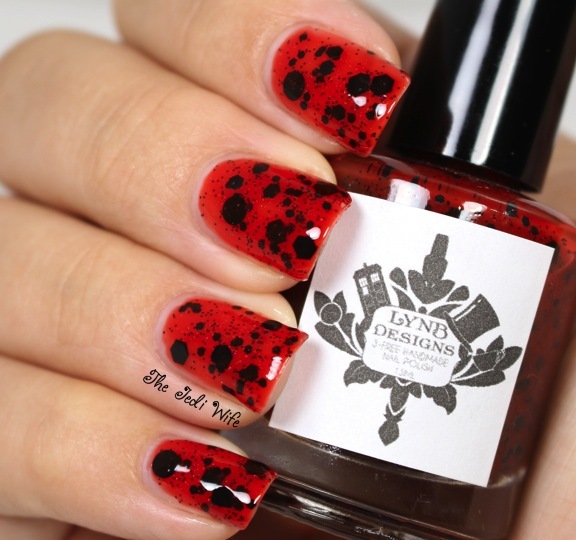 LynBDesigns is going to be releasing a polish collection next week inspired by the hit tv show, The Big Bang Theory. I absolutely adore the nerdiness and the social awkwardness of the characters in the sitcom, and I am delighted that Jenna, the mastermind behind LynBDesigns, chose to use it for inspiration. Her 12 piece collection is scheduled to be released August 22nd (that's next Friday). This collection includes a range of finishes and colours, and there is bound to be several that suit your fancy. I hope you're ready for a lots of photos! Here we go! Catatonic Ladybugs is one of my favorites from the collection. I feel like there aren't enough jelly polishes on the market, and I just adore this squishy red jelly! The black glitters spread easily over the nail, and it makes an easy but cute ladybug manicure. I used three coats of polish plus top coat for these photos. Resplendent Like the Noon Day Sun was one of the polishes from the collection I was a little unsure of in the bottle, but I really loved it once I had it on my nails. It's a fun little crelly- not quite as squishy as Catatonic Ladybugs, but definitely more so than just a creme-based polish. 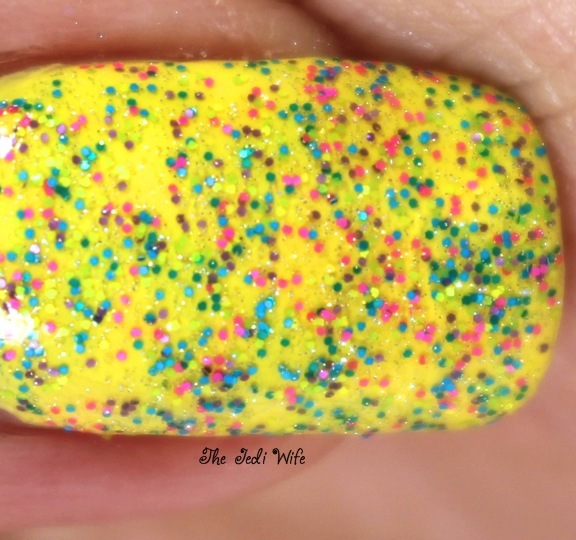 The density of the bright yellow circles and white triangles is significantly less than the other glitters, and they give subtle pops of colour on the nail. It could be the fact that I have fall on my mind lately, but this one really made me think of broken up candy corn. I'm going to be incorporating this one in a Halloween manicure soon! I used two coats plus top coat for these photos. Code Name: Froot Loops is the perfect "girl" polish; it has a beautiful light pink base, blue-purple shimmer, and colourful hexes throughout. The glitters were a little problematic for me in that they didn't want to break up very easily on the nail, and it resulted in a little patchiness in the base colour. It's a lovely polish, but it does require a little bit of patience. I used two coats plus top coat in these photos. Hot for Circles is another favorite of mine from the collection! 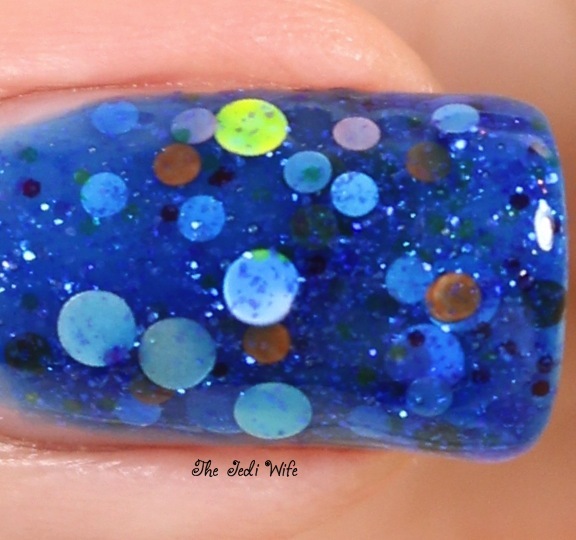 I should mention that circle glitters are always difficult for me to work with, and application was a little tricky. Some of the circles wanted to stick together, but they broke up pretty easily for me with a little extra attention. I love the way this polish looks; I never realized I was hot for circles! I used three coats plus top coat for these photos. 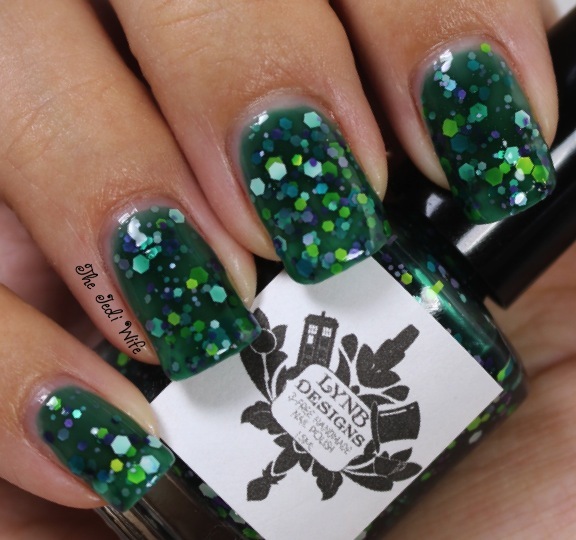 I was intrigued with Fun With Flags when I first saw it in the bottle, and I am pleased that it did not disappoint when on the nail! From the dark green jelly base to the colourful glitters mixed inside, it was love at first site for me. Some of the glitters took a little extra attention to spread on the nail, but it wasn't too difficult to work with and totally worth it! I used three coats plus top coat for these photos. Whoa baby, check out this bling! This silver holographic polish boasts even more bling by containing both silver and gold holographic glitters in different shapes and sizes. I love the light touches of gold mixed in with this silvery beauty; it simply dazzles! 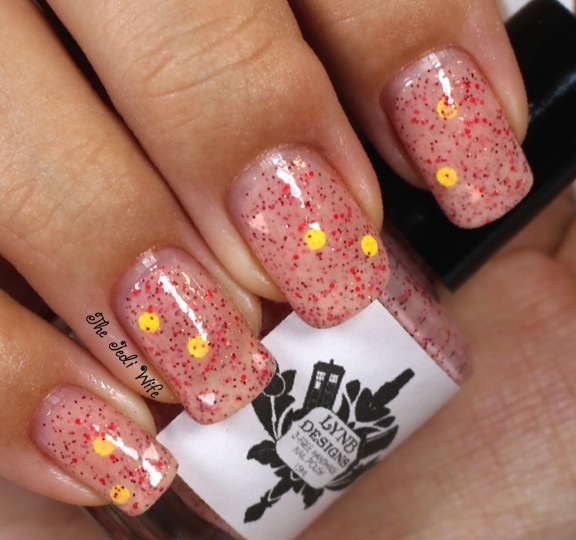 The application was smooth as well, and the glitters dispersed very easily over the nail. Ohh, It's a Tiara really makes me think of the holidays, and I know I'll be wearing it a lot soon! I used two coats plus top coat in these photos. How perfect is the name of this polish! I thought of Barbie when I first saw the colour, and I was delighted to see the name! I love holographic polishes that have a little something extra, and the pink, black, and white glitters inside this beauty are perfect. I don't always get excited about pink polishes, but this one was an instant favorite as well. 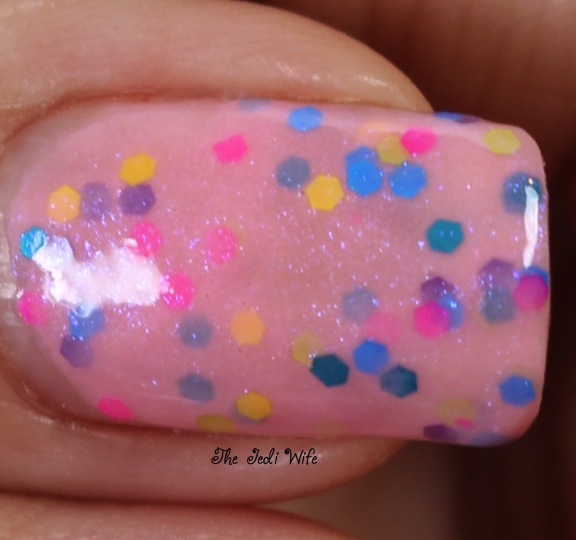 Looking at these pictures makes me want to put it back on my nails once I finish this post! The formula is really nice as well, and the glitters disperse easily over the nail. I used two coats plus top coat for these photos. 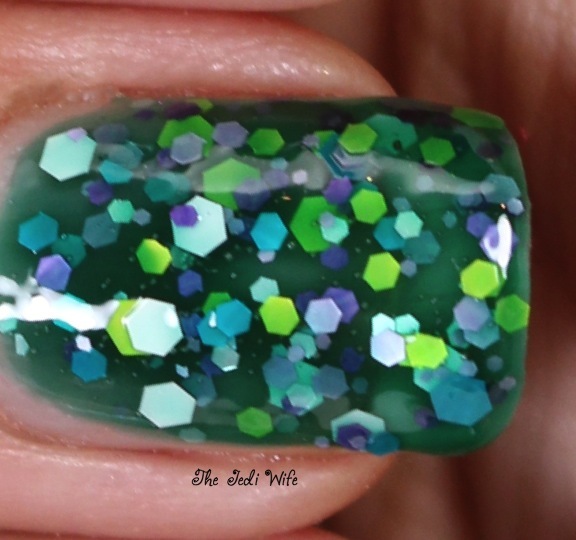 I was drawn to Perpetual Motion Squad when I first saw it because it is so different from any polish I own and have ever seen. The caramel based is packed with orange and blue iridescent flakes, and I can honestly say I've never seen a combination quite like it. It is a really fun twist on a basic fall shade, and I am so glad Jenna thought to give it a try! 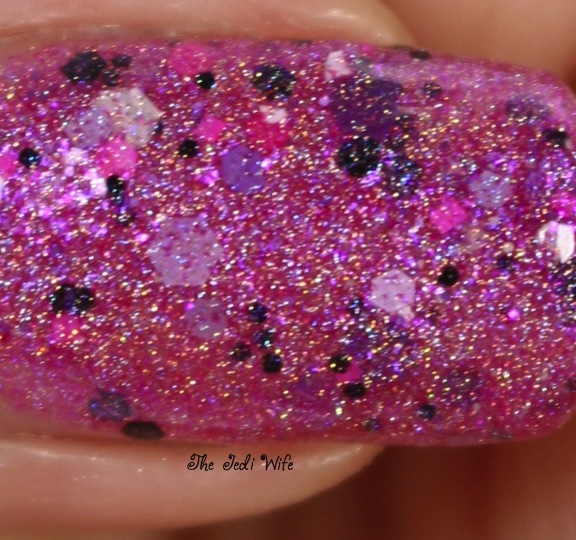 Perpetual Motion Squad, in my opinion, is the most brilliant polish in the entire collection. I used two coats plus top coat for these photos. As eager as I am for fall, I had to have another huzzah for summer manicure by placing Moisture Induced Glitter Clump over a bright yellow. 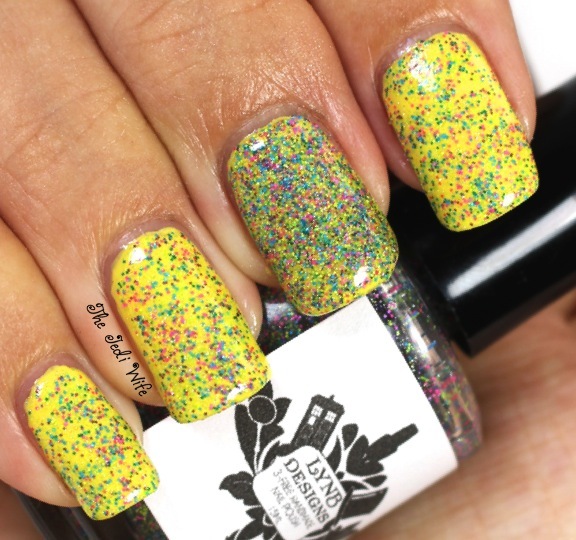 Even though this polish is loaded with lots of colourful small glitters, you're probably going to want to use it for layering rather that alone. I used one coat over the yellow base on my index, ring, and pinky fingers, and three coats over the yellow on my accent middle finger. You can still see quite a bit of the yellow base peaking out underneath the three coats, but it might be opaque in four coats with careful glitter placement. My nails were also topped off with top coat for these photos. 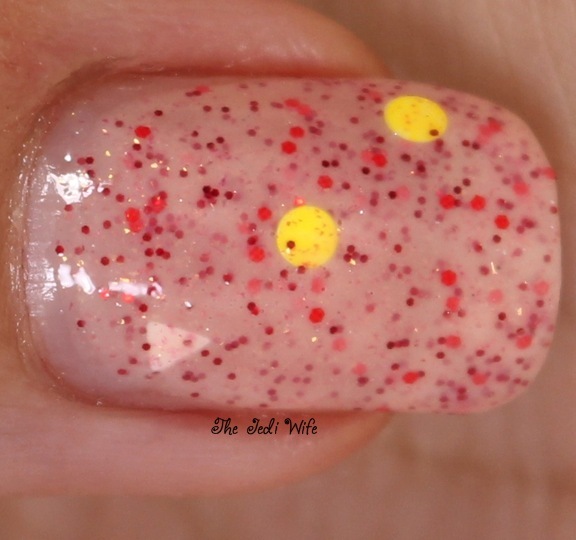 Check out the adorable cat-shaped glitters in this glitter topper! 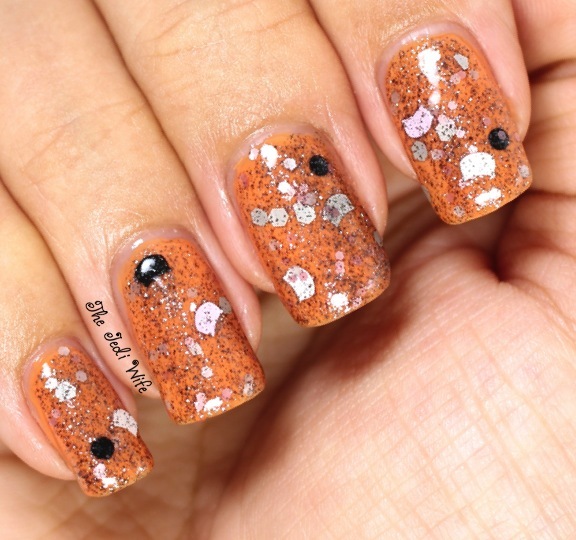 I really wanted these glitters to pop, so instead of using a black or grey background, I used a brighter orange. The small dark glitter in Sing Soft Kitty darkened my nails to look a little more burnt orange, and while I wasn't sure how I felt about the overall look at first, I ended up really liking them in the end. And have I mentioned the cat glitters?!? I'm usually not the biggest fan of odd-shaped glitters, but these cats are just too cute for words. There is a respectable number of cats in the mix, and I only used one coat of this topper with no digging around for them. They spread pretty easily on the nails, although the occasional cat ear wanted to stick to the brush rather than come off onto the nail. That being said, they were no more difficult to work with than other odd-shaped glitters and every cat lover is going to need this polish! I added top coat to my nails for these photos. I was blown away by the depth in this dark beauty. We're Lost Boys is so much more than just a black polish, and the charcoal and iridescent flakes really make it come to life! I love to wear dark polishes in the fall, and I am in love with this cousin of Perpetual Motion Squad! This polish reminds me of galaxy nails, and I like that you can get the look with just using one polish. I used two coats plus top coat for these photos. Whimsically Inventive is a gorgeous purple holographic polish loaded with light coppery microflakes. I love that the holo is a little more subtle so you can really appreciate the beauty of the base colour! The light coppery flakes add a nice warmth to the colour, and I'll be reaching for this one again! I used two coats plus top coat for these photos. I'm hope you're all still here with me after all that photo spam! There are so many amazing colours in this collection and so much variety! I love that there are jellies, holos and glitter toppers, and you really can't go wrong with this collection. The The Roommate Agreement Collection will be launching on August 22nd at the LynBDesigns Etsy shop. Be sure to follow Jenna's Facebook page for a specific launch time. Oh, It's a Tiara, Whimsically Inventive, and Your Ken Can Kiss My Barbie (the holos) will be priced at 10 dollars each and the remaining polishes from the collection will be 8 dollars a bottle. You also will have the option of purchasing the entire collection at the discounted price of $85. Entire collection orders placed with a US address will also receive free shipping. That's an awesome deal for 12 indie polishes! It's a beautiful collection, and I can't wait to see what Jenna comes up with next! Which of these polishes do you have your eye on? I'd love to hear what you think about them!